Our nice guide will meet you at the airport and then start your Xinjiang Photography Tour. City sightseeing in Urumqi. Xinjiang Museum,the museum is the main institution to collect and investigate the unearthed cultural relics and specimens in Xinjiang. There are more than 50 thousand pieces of various kinds of cultural relics stored in the museum, among them, the ancient mummies represented by ‘the Loulan Beauty', manuscripts in Chinese, Kharosthi, Qiuci, Yanji, Tibetan, Uigurian and other characters prevailed in ancient Westen Regions, the silk ,wool, cotton and hemp fabrics and folk rainment, etc., are unusual tidbits in the world. 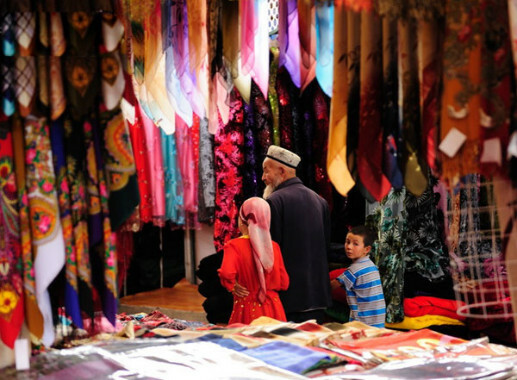 Erdaoqiao Market & International Bazaar is the largest in Urumqi. You'll find a bustling market filled with fruit, clothing, crafts, knives, carpets and almost anything that you can imagine. On Sunday, there are more stalls and more goods to buy than any other day. The old streets around the bazaar are really worth seeing.Here is the most welcomed place by tourist especialy by ladies where they can buy some traditional Uygur make up cosmetic. Burqin Colourful Beach. It is actually referring to the banks of a river that has desert, oasis and forest on its south side while sand/rock mounds in all shapes formed by years of wind erosion, line the north bank. The mounds have very irregular profiles and although they are mainly red, bands of red, white, black and yellow are also found in them. In the early morning, enjoy the sunrise of Erqis river and then head to Hemu --a fairy-land of Xinjiang Chna, also called the last pure land in the world. and experience the folklore of local Tuwa Pepole. and take the photo of the beautiful view of the sunset, enjoy the trekking around. what a fresh world !! Besides, we can arrange the horses riding for you. Hemu, a small village within the Kanas Lake area in the north of Xinjiang province, China, enjoy the untraversed snow mountain, icy lake, grassland and primitive Tuwa minority village whom lived there for thousand years. The Tuwa Tribe: A Mongolian tribe called Tuwa lives on the south bank of the Kanas Lake. Believing in Lamaism, it is a valiant ethic minority with a long history. Tuwa people speak Turkish, resembling the language of Kazakh, and live on hunting and graze. They also have a special folk custom. In the morning drive to Kanas Lake which is only 40km away from Hemu town. and enjoy the boating. Kanas Lake is the latest lake open to all tourists in China and has attained a reputation as “the tourism pearl of Mountain Altai”.There are six bays along the Kanas Lake and each of them holds a marvelous tale. A 'roche moutonnee', bedrock corroded by glaciers, can be found in the first bay. It looks like a sleeping sheep appreciating the beautiful lake and welcoming visitors from outside world. The second bay is the deepest point of the lake and also the place where monsters are often 'spotted'. It is said that some local livestock have been dragged into water by these monsters! The third bay is a nature platform for enjoying the marvelous lake, the fourth bay holds a lovely isle covered by trees, and a hill of magpies exists in the fifth bay. The sixth bay, which is at the end of the lake, is admired as a natural wonder by all visitors. Gathered here is a 2,000-meter-long (about 6,562 ft) bank of dead trees. No one can explain why these trees did not float downriver, but people say that it is because even the trees don't want to leave the beautiful Kanas Lake. There is a pavilion named Fish Watching Pavilion on the other bank of Kanas Lake. Because it is located on a hill, visitors can look down on the beautiful scenery of the whole area. In the morning you will have time to explore this beautiful land then then drive to Karamay, the Oil city in China and visit the Ghost City. Karamay("black oil" in the Uygur language) became famous in the 1950s for petroleum production. Oil and natural gas are Karamay's main mineral resources. The city has such tourist attractions as the Wurhe Ghost City, Mt. Black Oil Park, and the No. 1 Well, and so on. Ghost City: the most beautiful Yardan landform in this region.The movie “Crouching Tiger, Hidden Dragon” has left you a deep impression of the multi-colored bay where the heroine Ziyi was hidden, this special desert scene shot in the movie is located at the Gobi desert. Jiaohe Ruined: The Jiaohe Ruins is located on a mesa in willow leaf shape between the Yarnaz River valleys 10 kilometers to the west of Turfan City. running from northwest to southeast, 1760 meters long and 300 meters across at the widest part. The city includes city gates, streets and lanes, government office, temples, domestic houses, cave houses, wells, and an underground temple. Uyger ShowThe folk dance in Turfan is famous for its grace, nature, lightness and cheerfulness. Under grape trellises in summer, loud and clear sounds of tambourines and Suona horns, graceful dance, and affecting “Meshrep” can clear up the hotness and refresh you after you journey. Visit Bezklik Grottoes, Astana Tombs, Sugong Minerat. Bezklik Grottoes. “Bezeklik”means “a place with beautiful decoration”. There are 83 numbered caves; among them 40 preserved murals totaling 1200 square meters. These caves are first excavated in Qu`s Gaochang period. The exising caves were reconstructed or newly extended by Uighurian. In some caves one can find that Buddhish murals are painted on Manichean murals. Themes of the murals are mainly the stories about causes. Astana Tombs, covering an area of 10 square kilometers, the Astana Tombs are the graveyard of the residents lived in the Gaochang City in the Jin-Tang times, including large sized family graveyard. Between 1959 and 1975,here had been excavated 13 times, a great number of cultural relics have been unearthed, including Chinese documents, textiles, epitaphs, coins, clay sculptures, pottery, wooden wares, silk-paintings, crops and foods ,etc., and total number of them reaches tens thousands. Known as “the Underground Museum. Sugong Minerat Locatedin Mura Village 2 kilometers to the east of the city of Turfa , theTower was built in the 41st year of the Qianlong period of the Qing Dynasty,It is an embodiment of the ancient architectural arts of the Uygur nationality. The tower is 37 meters high and 10 meters in diameter at the base. The body of the tower is cylindroid in shape, built with bricks arranged in various symmetrical patterns on the outer wall. The tower has 14 windows and a spiral stairs inside it leading to the top. Karez Irrigation System is a unique irrigation system in Turfan, which, taking advantage of the slopes, draws the underground water to flow by itself to irrigate farmland. It consists of four parts: vertical wells, underground channels, ground canals and small reservois. Kuqa Mosque It is located in the north of the old city of Kucha and covers an area of 1165 square meters. With a capacity of 3000 people, it is the second largest mosque in Xinjiang, The mosque consists of a main worshiping hall, a small worshiping hall, a minaret, a qubbah, a religious court and hostels, etc. The mosque is a representative of Uygur architectural art of the Qing Dynasty. Subashi ruins The site is located on the ridges on both sides of Kucha River and 23 kilometers tto the north of Kucha City . “Subashi” means “headwater of a river”. It is composed of two parts divided by the river. With a lot of ruins of stupas, temples and grottoes from the Wei and Jin Dynasties to the end of the T`ang Dynasty, the site is the biggest site of Buddhist temples in Xinjiang. Kizilgaha Beacon Tower an ancient military outpost standing high over the bed of the Kuqa River. In the morning Visit Kizil Grottoes and after lunch head to Aksu.From the Western Han Dynasty (125 BC to 23 AD) to until the early Tang Dynasty (618-907 AD), Aksu was known as Gumo (姑墨 [Ku-mo]). It was an important stop on the Northern Silk Road. In Buddhist Sanskrit, it was known as Bharuka. (The ancient capital town of Nan ["Southern Town"] was likely just south of the present town.) During the Western Han Dynasty, Gumo is described as a "kingdom" (guo) containing 3,500 households and 24,500 individuals, including 4,500 people able to bear arms. Kizil Grottoes the caves were excavated on the cliff of Qul-tagh Mountain by the Muzart River, as the earlist caves in Xinjiang, they care also the earlist ones in China. The contents of these paintings are very rich. Including jataka stories, Budda’s life story and the stories about karma. Id Kah Mosque It is the large Mosque in China and most famous one in Xinjiang. The Mosque started to build in the mid of fifteenth century, and has gradually developed to the present size. Id K ah Mosque, with about 16800 square meters in area, consisting of Pray Hall, the Koran teaching Hall, The Corridor, the Arches and other buildings attaching to it. The Pray Hall of the mosque can hold 4000 prayers is supported by 140 carved wooden pillars.The buildings of Id Kah Mosque look magnificent and solemn , and display the artistic styles of Islamic mosque architectures. Handicraft Streets near this big market are choked on Sundays with farmers and buyers arriving by donkey cart, truck, bicycle, horseback, Ute, motorbike or on foot, with their animals. It's loud, lively and cheerful as they arrive, eat breakfast, set up their animals and check out the action. Cattle, sheep (they definitely look different), goats, donkeys, horses have their own ections; sellers show their animals are "good eaters"(most go as livestock not meat) and the entire experience is fascinating and fun. Karakorum high way It is 1200 kilometers almost Sino Pakistan—Chinese friendship high way build since 1976. Ancient Silk Road Merchants often run Via over Karakorum, Wahan corridor with Hindi Kush Mountain to India, Pakistan until Iran. On the road, enjoy the scenery of the Mt. Muztag, Taxkorgan, Persian language that means, stone castle, the brave Tajiks people lives on the Pamir more than 2000 year with nomadic life. Visit Stone fortress, Tajiks National art gallery museum and walk around the pastureland to see Local Tajiks customs. Karakul Lake At an altitude of 3,600 m. it is the highest lake of the Pamir plateau, near the junction of the Pamir, Tianshan and Kunlun Mountain ranges. Surrounded by mountains which remain snow-covered throughout the year, the three highest peaks visible from the lake are the Muztag Ata (7546m), Kongur Tagh (7,649m) and Kongur Tiube (7,530 m). The lake is popular among travellers for its beautiful scenery and the clarity of its reflection in the water, whose color ranges from a dark green to azure and light blue. There are two Kirgiz settlements along the shore of Karakul Lake, a number of yurts about 1km east of the bus drop-off point and a village with stone houses located on the western shores. In the morning visit Stone city, Honjirap Border. then back to Kashgar. Honjirap border which means "red wall"in Tajik language,while "blood ditch"in Uygur language.From ancient time up to now,it has always been the natural barrier that is insurmountable .In this place where oxygen is only 48% of the plain and there are just 60 frost free days,how can the soldiers and officers of Honjirap Border Inspection Station manage to live and work? The magnificence of the plateau and the indomitance of the soldiers and officers are fixed into Honjirap's picture. Sunday Bazaar (livestock Market)Streets near this big market are choked on Sundays with farmers and buyers arriving by donkey cart, truck, bicycle, horseback, ute, motorbike or on foot, with their animals. It's loud, lively and cheerful as they arrive, eat breakfast, set up their animals and check out the action. Cattle, sheep (they definitely look different), goats, donkeys, horses have their own sections; Apak Hoja Tomb This Mazar is the holiest place in Xinjiang and an architectural treasure Built in 1640 ， it is reminiscent of the Central Asian artistic style of Samarkand or Isfahan. A handsome blue-and-white tiled gate leads into the compound, which includes a small religious school and the Abakh Khoja family tomb. The latter is domed and faced with multi - colored tiles. I t most complete Islamic tomb of the Qing Dynasty up-to-now in China. Old town,walking in the streets of its Old Town, will provide a sense of what this legendary Central Asian hub was like in the days when the Silk Road was at its zenith. 500-year old remnants of the city wall, narrow lanes and colorful multi-ethnic crowds combine to make Kashgar's historic district a highlight of any visit to the city. Mogao Grottoes Constructed over a millennium, from the 4th to the 14th centuries, the caves hold the world's richest treasure house of Buddhist sutras, murals and sculptures.Cameras are not permitted. Echoing-Sand Mountain is quite literally an oasis in the desert. The spring's name derives from the crescent moon shape taken by the small pool of spring water between two large sand dunes. Although the area is very dry, the pool doesn't dry up as one might expect. Yumenguan Pass, It is one of the two important passes on the western frontier of the Han Dynasty (206 BC - 220) lands. In ancient times, it was the crucial gateway from central China to the western regions. Shazhou Night Market,It is not only famous for its tasty snacks and local specialties but also for its well-regulated management. The whole night market is 1000 meters long in total. There are shops selling handworks and souvenirs, food stalls and fruit stands. When the fruit season comes, visitors can buy juicy fruits at reasonable prices. You will be transferred to the airport and take the flight back to your destination based on your flight schedule.